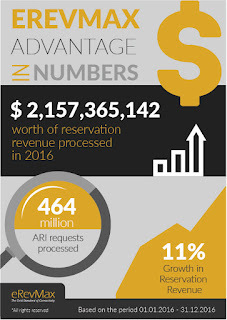 London, 17 February 2017: eRevMax, the hotel connectivity expert, has reported today that it has processed $2.1 billion worth of reservation revenue for its hotel clients in 2016. This is an increase of over 11% in reservation revenue as compared to the previous year. Hoteliers continue to increase online bookings through eRevMax platforms leveraging its seamless connectivity with over 300 global and regional OTAs and partners. eRevMax is known for its stable solutions with 99% product uptime. The company has invested in building a robust infrastructure to provide hoteliers with uninterrupted service offering 2-way XML connectivity with over 300 online channels and provides 24x7 customer support. It is the connectivity partner of choice for large hotel groups, mid-scale chains as well as small properties in both luxury and budget segment worldwide. About eRevMax: eRevMax is a travel technology company that assists hotels to maximise online revenue opportunities through real-time distribution, market intelligence and connectivity solutions. The company provides specifically tailored solutions within its core product brands – RateTiger, RTConnect and LIVE OS. eRevMax is working closely with over 300 certified channel and technology partners helping over 9000 hotels worldwide to increase revenue opportunities and streamline business processes. For more details contact on marketing@erevmax.com.